In 1903 Marie Marie Skłodowska–Curie won the Nobel prize for physics and in 1911 for chemistry. Today the Marie – Curie program by the European Union stands for scientific excellence and encourages intercultural and interdisciplinary scientific exchange as well as communication of science with the broad public. One branch of this program, called “EU – Glia PhD” (http://www.eu-gliaphd.eu) is a Europe wide consortium represented by internationally respected neuroscientists, industry and partner organizations. Within this several million Euros grand program financing PhD students, Oslo is represented via Kjell Heuser (M.D., Ph.D., senior consultant, dept. of Neurology, Oslo University Hospital - Rikshospitalet), who is also responsible for consortium wide training activities of the PhD students. The three-year long program comprises extended training of the PhD students, including education in neuroscience, various laboratory techniques, and communication- and writing skills. One of the dedicated scientific goals is the discovery of new therapeutic strategies for epilepsy by focusing as the name says on Glia (= Greek for glue) cells, astrocytes in specific. 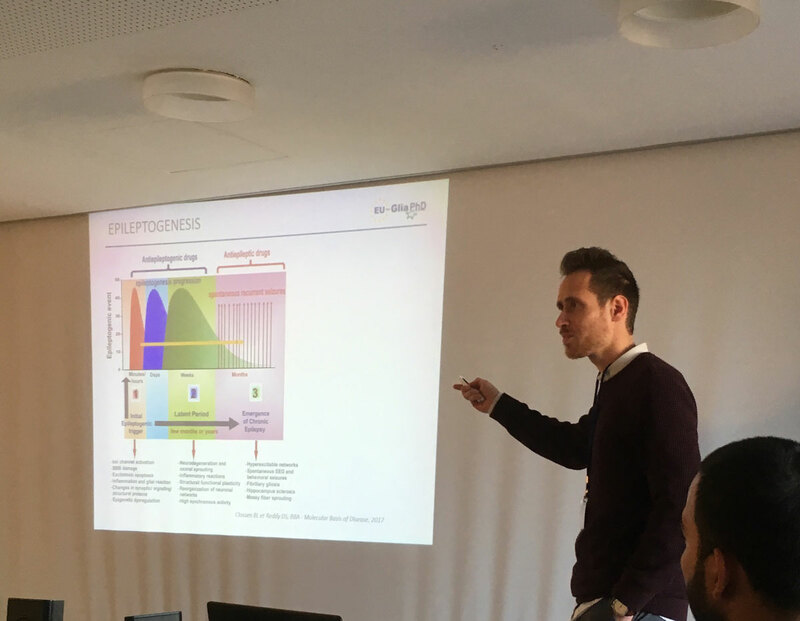 Kjell Heuser and Toni Berger (M.D., PhD student at the department of Neurology, Oslo University Hospital - Rikshospitalet) met together with the “EU Glia-PhD” consortium at the College de France December 10-18 2018 to discuss recent progresses of their research. They focus their research efforts on epileptogenesis (= the development and progression of epilepsy) comprising both the role of DNA methylation and Calcium signalling. The studies are done in collaboration with the research groups of Kaja Selmer and Erlend Nagelhus, respectively. DNA methylation is one of the main mechanisms within epigenetics (epi= Greek for above), determining which parts of the DNA are used and which not. We believe that changes in DNA methylation precede or prolong epileptic seizures and contribute to the development of certain forms of epilepsy. The group is working on being the first to investigate cell specific (neurons and glial cells) changes of DNA methylation in an epilepsy mouse model and correlate these with changes in gene expression within these cells as well as in blood. These results can be used for establishing a blood-based marker for epileptogenesis and with the dawn of new therapeutic options that can alter DNA methylation in a cell specific manner, they might a potential cure for epilepsy. The EU-Glia PhD project has received funding from the European Union’s Horizon 2020 research and innovation programme under the Marie Sklodowska-Curie grant agreement No 722053. 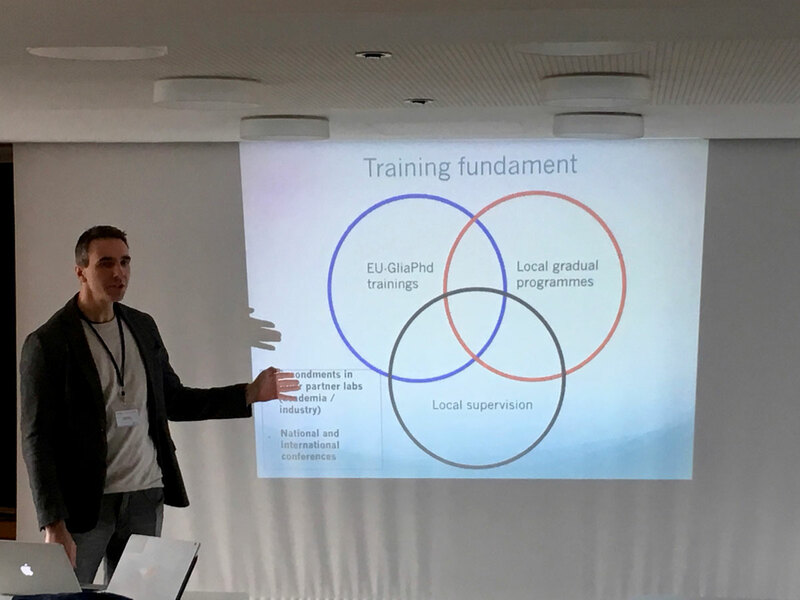 Kjell Heuser, presenting the consortium wide training activities for the PhD students. Toni C Berger, presenting his studies on epileptogenesis. 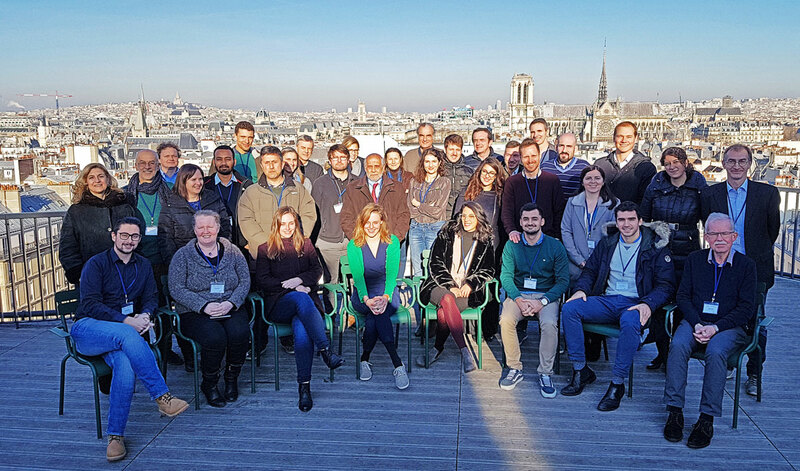 The EU Glia PhD Group gathered in Paris.